Mallards (Anas platyrhynchos) are a highly plentiful species of duck. They're extremely familiar to many, as common fixtures in ponds, marshes, streams and lakes. Sightings of these waterfowl in human establishments such as parks aren't uncommon, either. As migratory birds, mallards travel south each year to spend the cold winter months. Visually speaking, mallards are sizable and sturdy creatures. The male plumage combines elements of gray, brown, black and bright green, while the female plumage is mostly spotted brown. Mallards generally weigh 35 to 46 ounces. They're also usually between 20 and 26 inches in length. Male specimens typically exceed females in the size department, although not significantly. Food-wise, mallard dietary staples include water plants, snails, arthropods, worms, insects, grass, corn and seeds. When they migrate in the autumn, they eat a lot of agricultural crops, too. They aren't picky eaters and generally adjust to whatever is accessible to them. Mallards have a vast geographic range as far as reproduction goes. Many of them breed in the northern reaches of the United States, while others travel as far north as the Bering Sea off Alaska for these purposes. During their breeding season, they're particularly abundant in specific Canadian provinces, notably Manitoba, Alberta and Saskatchewan. Some of them also breed in more easterly Canadian locales, specifically New Brunswick. They're uncommon in Newfoundland and Prince Edward Island. In terms of the United States and breeding, mallards are prevalent in North Dakota. Mallards can migrate along a variety of different routes, but the majority of these ducks travel from the Canadian prairie provinces -- think Manitoba and Saskatchewan -- down into the United States' Midwestern region all the way to Mississippi, specifically the Alluvial Valley. The Alluvial Valley refers to the lowlands that surround the Lower Mississippi River. Although this region is the most typical destination of mallard migration routes, these ducks are occasionally spotted spending their winters elsewhere, sometimes as far south as the northern portion of Mexico. Some even prefer to winter in more northern spots, including the southern region of British Columbia. Mallards typically head south for migration anywhere between the end of August into December each year. Migration traffic is particularly heavy in both October and November, however. They tend to return to their reproductive grounds in February and March. 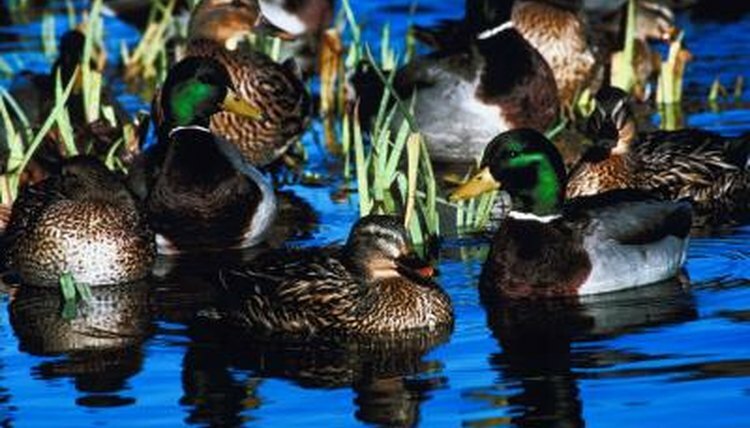 Not all mallards actually migrate, either, particularly if humans in a certain geographic location provide them with regular sustenance.